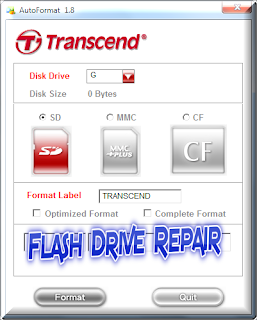 Format and repair any corrupted Transcend memory card .Download Transcend Auto formatter utility and fix Transcend memory cards problems for free. 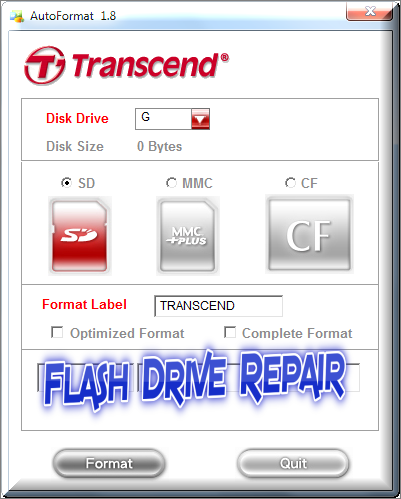 This Tool is a great format utility for repairing and formatting any Transcend Memory card such as SD types ,MMC and CF .Transcend auto format tool may work with VID=8644 and PID = 800B and may also fix USB stick with the same information . From the official Site of Transcend Co , I found this Important Notes for using the memory cards in the first time to avoid being corrupted later . 1. Is formatting a memory card before first use necessary? Yes. Since not every electronic device supports the same format, it is advised to format the new memory card in the electronic device before use in order to avoid unpredictable errors when trying to store data within a non-native folder structure. 2. What’s the reason why you can’t transfer files larger than 4GB? Simply put, it’s because the file being copied is too large for the file system to handle. FAT32, for example, can only handle files up to 4GB in size, while FAT16 can only handle up to 2GB. If you need to copy files larger than 4GB, please convert your partition format from FAT to NTFS. 3. Why does your memory card show less capacity than listed? It’s mainly due to the small discrepancies in algorithms and file formats by various operating systems. Some memory cards—like Transcend’s—are manufactured with 1-3% of the storage space saved for firmware and applications, and for the purpose of storage reliability. In Which case should use Transcend Auto Formatter v1.8 ? Windows can't format Transcend flash drive or Transcend Memory Card . Write protected Transcend memory card . Raw Transcend flash drive or Memory card volume . Transcend Flash drive or Memory card capacity is 8MB or 0 MB . How to repair Transcend Memory card ? Note that Formatting process will delete all data on your memory card.Transcend Auto Formatter support windows Xp , 2000 ,7 only . 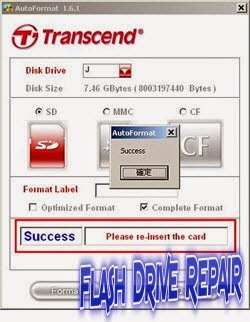 First try to format corrupted Transcend Memory card or Flash drive with normal windows format or by DOS format .You can read this article " ways to fix write protected usb flash drive and memory card " . If the first solution doesn't work with you , let's try our Transcend Auto Formatter V1.8 . Download Transcend Auto Formatter v1.8 from the download link in the bottom of this article . Insert your Transcend memory card to your computer then open Transcend Auto Formatter utility . Transcend memory card will appear in the program interface with the real or exiting volume , choose the type of the memory card SD or MMC or CF . You can make complete format for Transcend Memory by choose Complete format or you can make quick format by clicking Format . Wait a moment until finish formatting your Transcend Memory Card . Congratulation , Your memory is fixed now . Don't Forget to subscribe to our mailing list or Facebook page to get the latest Flash Drive Repair Articles . If you have a problem with this article or Transcend Memory , please leave a comment describing your problem .